Shackleton’s is a fairly standard pub, in an unspectacular part of Long Island. The menu features nothing that demands to be sampled, and while there’s a tasty beer or two, the selection is less than superb. And, as you might expect from that kind of establishment, the sandwich was, well, tasty enough. It was fried fresh, which is a pass/fail sort of quality, the sauce was fine. The only real downside is that the bread, billed as a garlic hero, doesn’t really carry much garlic flavor. It’s there, somewhere, but as someone who likes a heavy dose of garlic, I was disappointed. There wasn’t too much cheese. Like I said, it was tasty enough. But let us consider this for a moment, the idea of good enough. This, I think, is one of the more wonderful things about sandwiches: most of them are pretty good. They aren’t hard to make, there are a substantial number of established classic forms you can work with, and in the end you’re more likely to get a good result than a bad one. It’s the best of all things. A hot dog is easy to make, but there isn’t much going on. A full meal can be delicious, but there’s a good amount of work involved. A sandwich, though, is a simple route to fine things. Thanks to the sandwich, I could enter a fairly ordinary bar on an ugly stretch of road and know that I was probably going to come away satisfied. “Most sandwiches are good” might seem like a tepid, pedestrian sort of insight, but think about it. I ate a sandwich today. I went in knowing that my life was probably going to be a bit better off for having eaten it, and I was right. I put it to you that that is no small thing, and that sandwiches can bring us these things is something for which we should be very grateful. 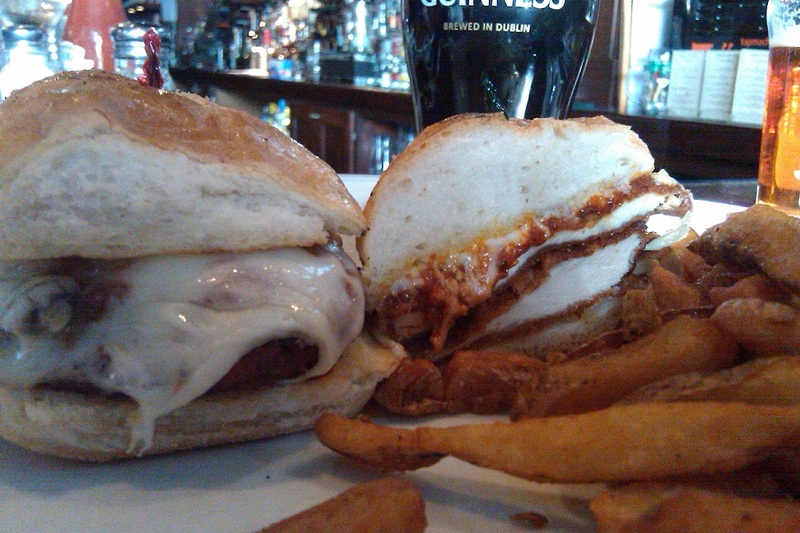 This entry was posted in Sandwich Reviews and tagged Chicken, New York, Reviews by Pete by Pete. Bookmark the permalink. One of the things I miss (but don’t really miss) from an omnivorous diet is that coagulated mass of cheese dripping from the sides of sandwiches. It reminds me of the comforting nature of unhealthy foods, and a time when eating a mass of nasty seemed okay. What I’m trying to say is that the sandwich looks delicious, even if in a terrible way to me.